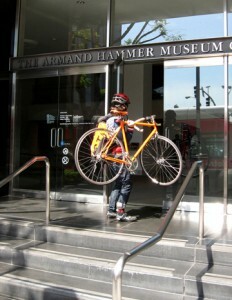 I rode over to the Hammer this morning for the press preview of Nine Lives. The concept of having nine lives is never more important than when navigating the mean streets of Los Angeles on a bicycle. I live in Jefferson Park. It's a bit of a schlep to the museum from home, maybe 10 miles, maybe 12. Who knows. I don't have an odometer and mileage doesn't matter so much when you're on a bike. It's more about time. I left around a quarter to nine and got to the museum an hour and a bit later. If you just keep going, doesn't matter how slowly, eventually you'll get where you're going. Rode Pico most of the way, and it was a pretty smooth and uneventful journey. Century City is a bit of a daunting area and riding around it is a bit hairy. Just big wide streets and people driving pretty quickly. There's not a great East-West route from my place to Westwood, so gotta make do with the streets that exist. Wilshire going West through Beverly Hills is the worst. First of all, I always get the feeling that Beverly Hills drivers don't like bikes and don't want to be bothered with sharing the road. Then there's that section through the country club, which is total death. No shoulder, no sidewalk, and since there aren't any turn-offs, the drivers just go as fast as possible through there, and since it's Beverly Hills, they have big ridiculous cars or really fast ones, and they're on the phone doing some sort of business, so not really paying attention. The last time I tried going though that area, on the way to an opening at the Getty, I was sobbing near Barney's when I finally called Louis to pick me up. Because I'm an eternal optimist, I thought perhaps the area wasn't as bad as I'd originally thought, so I've ridden through a few other times and it's horrible each time. So Pico was the choice this time around, and it wasn't so bad. All the way to Westwood and then north to the museum. After the preview, I had to meet my grandmother and aunt for lunch, so I took the bus down Wilshire so I wouldn't have to risk it. From the bus windows I could see a sidewalk on the south side of Wilshire, through that grisly stretch. I'd never noticed it before, but next time I'll just cross over and ride the sidewalk! Trying to figure out some good routes that people can take over to Bike Night at the Hammer!, which is on April 16. A cross-town commuter friend of mine also suggested Olympic, so maybe I'll try that too. Storm clouds came into view after lunch and I had to hurry home. The sweater made to wear to the opening was drying in the backyard and I couldn't risk it getting soaked. The rain never did materialize and my new No On 8/Octomom sweater was warm and dry and ready to go.